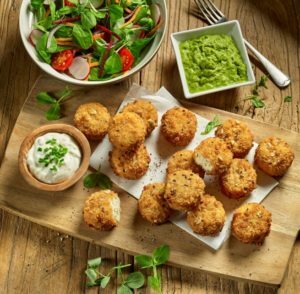 Following the explosion of the street food scene recent years, Young’s Foodservice has launched two new mini fish cakes to help operators cater for this popular trend. The two innovative varieties include spicy salmon and black bean, coated in a crispy cracked pepper crumb or MSC certified cod and parsley, wrapped in a sunflower seed coating. The new options provide plenty of opportunity for operators to inject something that little bit different into their offering. The tender flakes of salmon with black bean have a subtle spicy kick whilst the cod, parsley and sunflower seed crumb provides a mild nutty taste, creating a flavourful bite with every mouthful and making a real statement on the plate. Both flavours are equally tempting and great for suiting the varying tastes of today’s customers. Street food is renowned for being innovative and operators must ensure they are keeping up with the ever-changing flavours and concepts on the market. Many different foodservice outlets are finding inspiration and looking at ways they can add a street food inspired flair to their menu. The mini fishcakes cook to perfection straight from frozen, either by baking in the oven for 15 minutes or deep frying for 6 minutes. These modern, innovative and tasty options are the ideal 30g size to be used in a range of formats including grab & go menus, sharing boards and starters. They can be served with a variety of complementary accompaniments, such as a minty yoghurt dip or lemon and herb aioli or simply served with a fresh wedge of lemon or lime.